Manometers are the devices containing some columns of suitable liquid to measure the difference in pressure. 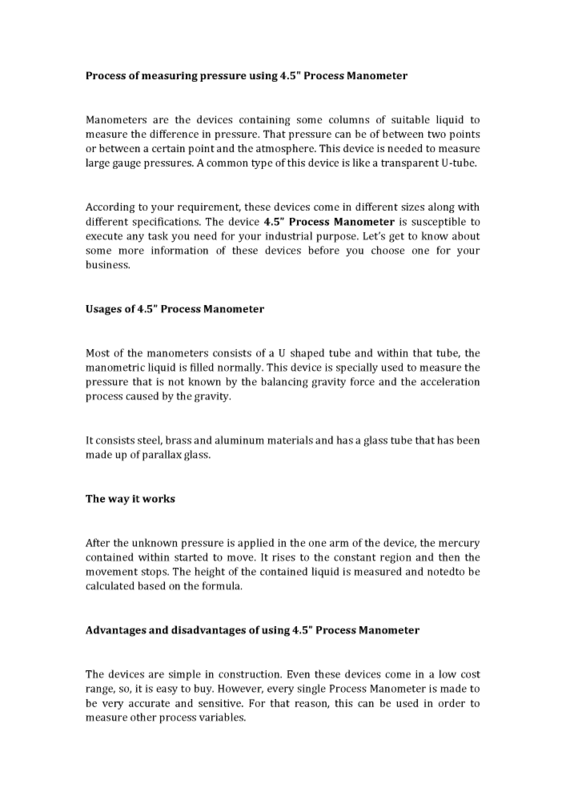 Process of measuring pressure using 4.5" Process Manometer Manometers are the devices containing some columns of suitable liquid to measure the difference in pressure. That pressure can be of between two points or between a certain point and the atmosphere. This device is needed to measure large gauge pressures. A common type of this device is like a transparent U-tube. According to your requirement these devices come in different sizes along with different specifications. The device 4.5” Process Manometer is susceptible to execute any task you need for your industrial purpose. Let’s get to know about some more information of these devices before you choose one for your business. Usages of 4.5” Process Manometer Most of the manometers consists of a U shaped tube and within that tube the manometric liquid is filled normally. This device is specially used to measure the pressure that is not known by the balancing gravity force and the acceleration process caused by the gravity. It consists steel brass and aluminum materials and has a glass tube that has been made up of parallax glass. The way it works After the unknown pressure is applied in the one arm of the device the mercury contained within started to move. It rises to the constant region and then the movement stops. The height of the contained liquid is measured and notedto be calculated based on the formula. Advantages and disadvantages of using 4.5” Process Manometer The devices are simple in construction. Even these devices come in a low cost range so it is easy to buy. However every single Process Manometer is made to be very accurate and sensitive. For that reason this can be used in order to measure other process variables. Though a 4.5 Process Manometer is simple for construction but at the same time is fragile for that purpose. It requires to be handled in a careful way during the process. These devices are way too sensitive for temperature changes and because of that reason error can occur while measuring. Things need to be paid attention on First of all one must know that the viscosity is something needs to be low while operating this 4.5 Process Manometer. Low surface tension is also required during that. Check whether the liquid is sticks on the walls or not as it is crucial. Even the liquid must not get vaporized. So these are the things that need to be taken care of before every single operation to be executed. Based on these things the device will be able to give a proper outcome of the operation. No matter what keep the devices in a safe zone as these are way too fragile. No one will like to get the devices used for only one use. However these devices are very accurate to help you get the best result of every single process. You just have to keep it in a safe way otherwise it will not be able to work effectively. Measuring Instruments by Sudershan Measuring & Engineering Pvt. Ltd.